The odds of correctly plugging in a USB connector without peeking are 50/50. Therefore it will take you three tries to plug it in. Even when I peek, I still get it wrong oftentimes. The same thing happens to me with game rules. It may be a blind spot, where no matter how many times the question comes up, I can’t assimilate the answer. The rule for characters going insane or unconscious in Arkham Horror is one case of this: remind me what counts as an item they can lose? With expansions, it becomes even more of a quirky corner case that rarely comes up as players opt to take a madness or injury, since they’re less directly debilitating than losing hard-won goodies. Other times, a rule can go one of two ways, and my brain always picks the wrong way to remember it. Even when the information is written out right in front of me on a card, I get lost in the heat of figuring out to do and can consistently misread something until I throw it on the table and someone else points out that’s not how it works. I very consistently hamstrung myself in a game of Sentinels of the Multiverse a couple weekends ago because I misread Haka’s base power as doing 1 damage, rather than 2; and considering that’s his core shtick, it was a big goof on my part and very annoying to have pointed out after three or four turns of playing it wrong. This week, playing Call of Cthulhu with Toby, I think I misread Fine Dining about seven times: “Sacrifice a character to choose a character with printed cost 2 or higher. That character gains (C)(C)(A)(A) and Invulnerability until the end of the phase.” About half of the times I looked at that card — and I had to keep looking, because I knew my brain was flip-flopping between two possible interpretations — I thought the sacrificed character had to cost 2 or greater, rather than the character benefiting from the icon boost. I think I threw that one on the table to play incorrectly only once, but I glanced at the text to double-check no fewer than a dozen times, easily. This kind of brain fart comes with learning any game, particularly those with extremely fine grained rules and wording. Add on the hyper-modularity of games with pre-constructed decks, and it seems like I’ll be training myself to read every word and consider its meaning — and kicking myself when I forget to do so — for a long time yet. After the euphoric high of opening a new board game, probably the next strongest emotion is the swell of despair as you process just how thick the rule book to the intricate and theme-laden game you’ve just bought actually is. And often times, the density of that rule book teams up with its cunning partner poor organization to make figuring out how to play the game clear as mud. But don’t despair. There is help available. I’ve sung the praises of Universal Head’s rules reference sheets before while playing Arkham Horror and Android. Since then, Universal Head’s work has migrated to the Esoteric Order of Gamers, where the repository of games covered has only grown in the past couple years. When I acquire a new title completely unplayed, know I’m going to be learning something new or will be teaching a complex game to a newcomer, the Esoteric Order of Games is my first stop. Universal Head’s summary sheets have just the right mix of solid graphic design and strong structure to pack a whole game into what is usually a few double-sided sheets and a half-page of turn order details. If you’ve ever paged through a rule book and been completely baffled by the turn order, or directed to see another section that you can’t find, you have got to check out Universal Head’s work. The references for Android: Netrunner and Call of Cthulhu: The Card Game live in a manila folder right next to the rule books, and that folder never leaves my game bag. When a question comes up, Universal Head can almost always answer it faster than consulting the rule book. The reference sheets are just that good. Since I cracked open Miskatonic Horror last week and spent some time ogling all the cards, one thought in particular has recurred to me: how could the Kingsport board be made more appealing? As it stands, visiting Kingsport is seen as a chore: investigators have encounters at locations in order to shut down rifts or prevent them from opening. It can get repetitive without a lot of tangible reward; “there’s no dimensional rift spewing creatures into the streets” fails to satisfy in the way racking up a pile of monster corpses can, or sealing a gate. So I’ve been brainstorming some house rules to make Kingsport not only a little more appealing, but less of the time sink trap that it usually works out to be. This is an untested list of wild ideas at the moment, and I wouldn’t recommend using them all at once. When adding a token to a rift track, place a clue token at the pictured location. When a rift track fills, randomly select one of the four tokens used to fill the track. That location is now replaced by a gate to an Other World, which behaves like all other gates for the purposes of investigating and closing or sealing. The matching rift token is turned over and any duplicates replaced by new, non-duplicate tokens from the supply. At the start of the game, randomly draw three markers from the rubble token pile from Dunwich Horror and three rift tokens. Place one of the rubble markers on each of the Kingsport locations. Thanks to the dimensional instabilities that plague Kingsport, those locations are now colocational with the Arkham locations pictured on the rubble tokens. When moving into either the Kingsport or Arkham space, investigators may choose which they stop in. Investigators in these spaces may trade items and use other abilities as if they were in the same space. Another, more involved project I kind of want to attempt is to completely rework the Kingsport board. Ideally that would make visiting the Strange High House less of a trap, rework rifts or repurpose the materials for some other interesting challenge and otherwise spicing up the town. It would not mean making locations unstable, because that spins out into redoing or adding a stack of mythos cards to trigger gates opening in those locations — unless maybe unstable locations in Kingsport replace counterparts in Arkham. That’s kind of interesting. Hmm. If I’m producing a podcast, you know it won’t be long before Arkham Horror gets into the mix. Episode 3 of Carnagecast is the first in a multi-part recording of an Arkham Horror session from last month. We played with the Dunwich, Kingsport and Miskatonic Horror expansions, so there were cards flying every which way. Give it a listen, won’t you? I would love to get some feedback. 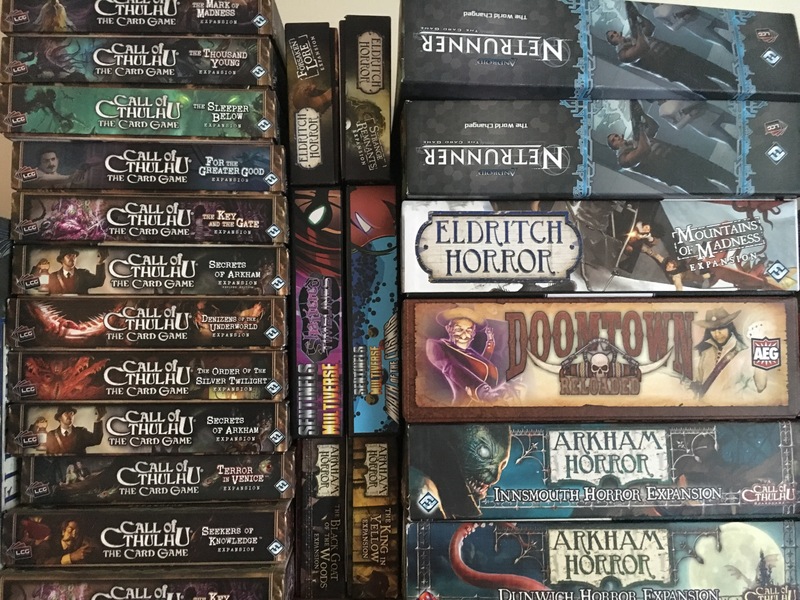 Travis of Boardgamegeek brings us the pinnacle, the acme, the highest of achievements in figuring out how to store the sprawling excesses of Arkham Horror and its expansions. The picture to the right is just the tip of the iceberg. 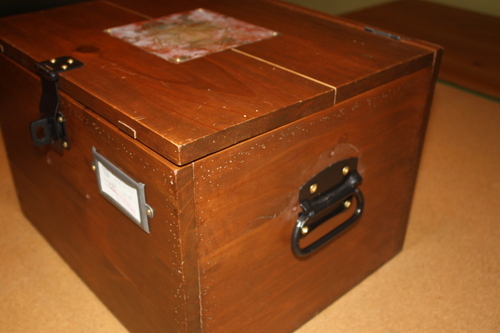 Travis takes you into the case, its myriad compartments and the many pieces of accoutrement with which he gussied it. Check it out now — and bring a snack. It’s a long journey.
. . . just prior to drawing the first Mythos cards, all players set their skill sliders and we run an Arkham Encounter Phase (and, if necessary, an Other Worlds Encounter Phase) with Investigators at their starting locations. (They must draw an Encounter, rather than using any special abilities of their Investigator or the location). This has allowed us over the last few dozen games to get some idea of the Encounters available on green diamond locations. We still only visit them when we cannot reach our objective for the turn, but we like the added atmosphere and better sense of what our options are. Next time I get to play Arkham Horror, I will suggest we try that. Thanks, Bern!